Lighthouse Wrestling wanted to interview Neil Alton in order to find out how a former wrestler from Long Island could develop his two children into two of the best wrestlers in the country. Was it the coaching, genes, the water they are drinking in Pennsylvania? How and why have these wrestlers dominated the sport? This interview will answer these questions and more. There have been quite a few successful brother teams who have excelled in the high school and collegiate wrestling ranks. Most notably have been Ben and John Peterson in the mid seventies, Ed, Lou and Steve Banach in the eighties and most recently the Brands (Tom/Terry), Smith (LeRoy/John/Pat/Mark) Scherr (Jim/Bill), Bonomo (Ricky/Anthony “Rocky”), Steiner (Troy/Terry) and Paulson (Travis/Trent) brothers to name a few…Now, we have a new tandem, Andrew and Dylan Alton of Central Mountain High School in Pennsylvania. Dylan Alton is coming off his first High School State Championship at 135 pounds, which was the first in school history. Twin brother, Andrew captured his second consecutive third place finish in a very tough Class AAA at 140 pounds. Both have climbed the ladder into the record books at their high school in almost every category. Both boys have achieved success every time they have stepped onto the mat. 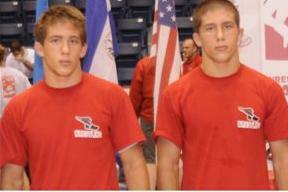 Dylan and Andrew have been on the podium at the FILA Cadet National Championships in 2007 and 2008. 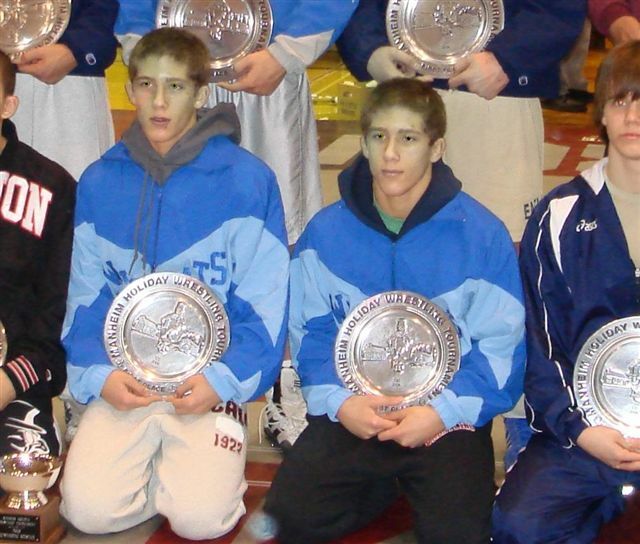 They actually shared the award as co-champions, electing not to wrestle in the finals this past April. They have watched each other enjoy success in Fargo, with both emerging with a Junior National Freestyle Championship in dominate fashion in 2008…Dylan won the Greco National title as well…Perhaps most impressive was the second place finish by Dylan at the FILA Junior World Team Trials this year…And the list of accolades goes on and on. Andrew and Dylan are both currently ranked in the top five in the United States at their respective weight classes and are on the wish list of every major wrestling program in the country. It goes without saying that whoever lands the Altons will be receiving two gifts under the Christmas Tree. We spoke with Neil Alton, the boys’ father, who under the tutelage of Paul Gillespie finished 6th in the State in 1980 as a representative of Long Beach High School (Section VIII)…Mr. Alton continued his wrestling career at Westchester and then Temple University where he was a two-time NCAA national qualifier. LHW: How did you get your start in wrestling? Mr. Alton: I started in wrestling when a coach in the Junior High School grabbed me because I was always getting into fights in the hallway. Other kids would make fun of my Irish accent back then and picked on me because I sounded funny. The junior high coach said, “hey if you want to fight these guys come to practice after school and you can go at it with them as much as you want.” I remember there were two pairs of wrestling shoes left over in the box of shoes when I went to practice. There were three lefts and one right shoe. I had to do rock – paper – scissors with another kid, and lost. I wrestled that year with two left shoes. LHW: What kind of influence was Paul Gillespie on you? Mr. Alton: I wasn’t a very talented wrestler, probably a little bit above average. So Paul has done a lot for me outside of wrestling too, and he did the best he could with wrestling also. I never really knew this sport or wanted to win until I met Paul Gillespie and saw the sport through his eyes. What Paul Gillespie has done for me I can’t really put into words. But this I can say about him. He has been the biggest influence in my life other than Cary Kolat when it comes to wrestling. Paul was an older brother type figure in many ways. When myself and a friend had gotten into trouble during our junior year in High School (Paul’s first year coaching at Long Beach, NY), he locked us in the equipment room and asked us how bad we thought we were. I had seen Paul mad before; but this time it was for real. I mean he was ready to throw down right then and there with the both of us at once, no holds barred. He was ready to take us both on to teach us a lesson in life and get his point through to us (a teacher today would probably get into a lot of trouble if he tried this method), but it worked for us. I knew then that Paul really cared and wanted his wrestlers to really see wrestling and life through his eyes. I knew then that what Paul wanted us to know was that being tough didn’t mean you had to be a person who could fight, what it meant was doing your work to the best of your ability day in and day out. That is what makes a man. Paul had a brother who did time in prison and he wanted us to know that ending up there was no life at all. Slowly but surely I started to keep different company and knew then that if you hang around with crap, you will smell from it. So Paul’s influence on me was huge. It took a while for me to see the whole picture, but Paul had gotten me on the right path and stayed in touch always, even to this day we speak regularly. He always was just keeping in touch and asking how was everything going. It is like he still cares about the lives of those who wrestled for him. My sons both know him well too and I have told them over the years Paul’s philosophy on wrestling which is simple. It is the same as many others teach— Hard work is the key to success in wrestling and in life. They have heard his name and his sayings echoed for many years when they were young through me. Paul is the real deal in wrestling and life. He just retired and then before you know it becomes the Chief of Lifeguards in Long Beach, NY. I knew he couldn’t slow down it is not his nature. Come back on Wednesday for the continuation of the interview and Thursday for the final part of the interview. For those who don’t know the reference, Neil Alton snatched victory from the jaws of defeat when he pulled an upset and secured victory for LB in the dual meet championships back in 1980 against Bethpage. It always came down to one match, and in 1980 it came down to our best wrestler on the team, Tony Piccolo, who was favored to win and Neil stuck him. Ben, maybe you can fill everyone in on the drama of the match up; I don’t remember it as vividly as you do. It was a great rivalry, and even though we always lost, we respected the hell out of LB. Giving them the tough battle that we always did never made it feel quite like losing, however much it did sting. I’m glad you like the site. The writers are doing a great job. Ben…keep in mind that Bill did not do the interview….Irlo did…LOL. Irlo, great job on this interview.